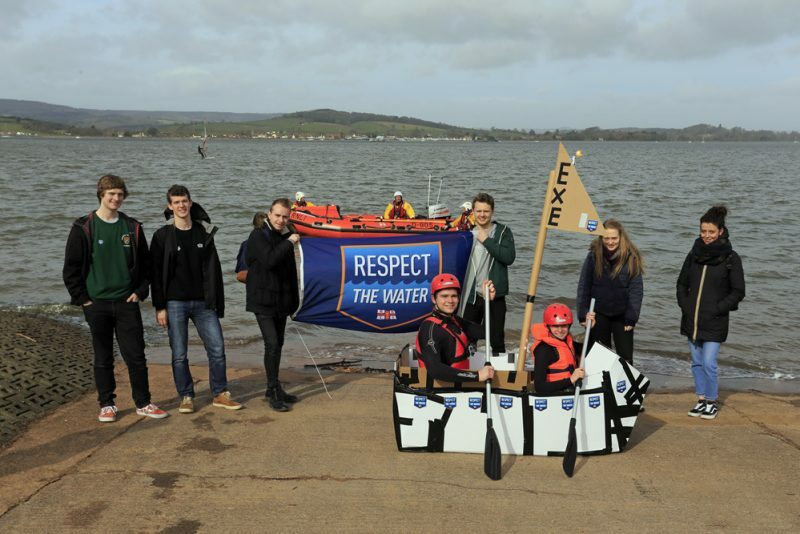 On 23 March, Crew and Community Safety volunteers from Exmouth lifeboat station supported Exeter University students in their cardboard boat challenge, on the river Exe. The team from Exeter University College of Engineering, Maths and Physical Science were set the task of designing a boat out of two cardboard boxes in three hours, to carry two people on the water. The lifeboat station were approached for advice to see if it was possible to test the boat named All a-cardboard on open water in Exmouth. Community Safety Officer, Dave Littlefield advised the students on tides and suggested a safe location known locally as the Duckpond. Inshore lifeboat volunteers, who were on exercise with D class lifeboat George Bearman II in the river Exe, helped the two students into All a-cardboard at high tide, which was waist-deep. They were both suitably dressed for their own protection in the cold water. Watched by their supporting team mates, RNLI Lifeguards, Exmouth RNLI Community Safety team and members of the public, Jack and Talia had three brave attempts to keep the boat afloat before it became too wet and eventually collapsed. Emma Tarling has been a Lifeboat Press Officer at Exmouth Lifeboat Station since May 2011. She is one of over 250 volunteers who work to raise the profile of the RNLI through the media.